Our search for a more affordable holiday and our love for remote locations were perfect ingredients for a trip to the Azores. The Azores have been on my wish list for years. The first time I read about this argipelago was probably in 2004 in a book called Top 100 Must See Places in the World http://www.bol.com/nl/p/nederlandse-boeken/100-wereldplekken-die-je-gezien-moet-hebben/1001004010214611/index.html by Dutch Travel TV Host Floortje Dessing. Of course there were many questions; what island(s) to visit, when to go, where to stay, what to bring, what to do etc. 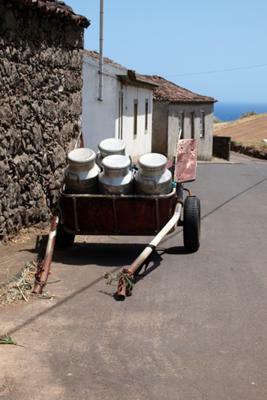 So I started by ordering the highly recommended Bradt Travel Guide Azores http://www.bradtguides.com/Book/62/Azores.html, since my favourite Lonely Planet didn?t publicize a guide for the Azores. A very good resource on the internet is this website: Magical Azores Islands https://www.magical-azores-islands.com. After reading up on the whole of the Azores and comparing some prices, we figured São Miguel should keep us occupied for over a week, saving us some money by not going island hopping this time. After reading the reviews and a good price / quality ratio we decided on Quinta das Acácias http://www.quintadasacacias.net for our stay. It turned out to be a very good choice. It?s peaceful, the cottages are clean and comfortable, we loved the wooden lounge chairs on our patio. The owners, Ed and Bonita, and their son Brandon are very helpful. A perfect place to get away from your busy Western life style. We arranged our flight through CheapTickets.nl http://www.cheaptickets.nl. It?s definitely worth comparing different days of the week, it?ll save you a lot of money! We booked at TAP Portugal, but most of our flights were operated by Sata Airlines, which was a very pleasant experience. My husband had enough space for his long legs for a change. We rented a car at Hertz. Even though we made a reservation, a must in high season, we got a smaller car (Peugeot 107) then we asked for, it had some trouble going up hill, but in the end it was the perfect car for all those narrow roads. The twisty roads along the coast and through villages were quiet and beautiful. The new highways were partially complete when we were there, but I would never entirely skip the scenic routes. The main thing we wanted to do on the island was hiking. I just got myself a GPS for my running, which could also be used to import walking trails from the Trails Azores Website http://trails-azores.com/index.php?lang=en. Altough most trails are clearly marked, the starting points weren?t, so it was nice to have the GPS as backup. We skipped all trails marked as ?hard?, most ?easy? ones proved to be too simple for us, ?medium? fitted us best. Also, it?s important to check the website for any closed trails. Our top trails were Faial da Terra to Salto do Prego (PRC9SMI) and Praia to Lagoa do Fogo (PRC2SMI). As northwestern Europeans we have high expectations of food, the food on São Miguel wasn?t up to our standards, but tasty nonetheless, especially when you don?t feel like cooking yourself, which we did do a couple of times. We had a very good burger in a simple snackbar in Nordeste though. The one thing we were amazed by was the cheese, look for ?Queijo São Jorge? at the supermarket, we loved it?s saltiness. Speaking of supermarkets, they?re chockfull of familiar European products. Even though we brought a Portuguese phrasebook, there was no need for us to use it, thankfully! It?s a very difficult language. Most of the Azoreans we talked to spoke English, some of them just a bit, but enough to understand each other. Flight from Amsterdam via Lisbon to Ponta Delgada. Picked up our rental car and checked in at Quinta das Acácias. In the evening Bonita arranged a performance by Rafael Carvalho on his Viola da Terra. 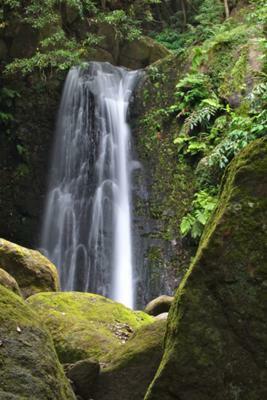 We walked from Faial da Terra to Salto do Prego (PRC9SMI) http://trails-azores.com/index.php?ilha=saomiguel&id=51. Beautiful tree covered trail with a waterfall at the end. We packed lunch, which we had on the rocks at the top of the waterfall. This turned out to be the best trail we did! This day we walked around Furnas Lake (PRC6SMI) http://trails-azores.com/index.php?ilha=saomiguel&id=42. The Caldeiras (hot springs) are a must see and it?s interesting to see the Azoreans cook their Cozida (stew) in the thermally heated ground. We were fascinated by the old church, Chapel of Nossa Senhora das Vitórias, on the other side of the lake. We ended our walk at Terra Nostra Gardens where you can take a swim in the hot spring fed pool. To be honest, this wasn?t our kind of walk, we like feeling-like-the-last-man-on-earth kind of trails. We did a car tour along the north west coast of the island. Our first stop was Ponta da Ferraria, where a hot spring feeds a natural swimming pool. Damn me for not bringing any water shoes, this volcanic rock is sharp! Next up the impressive rock formation at Mosteiros. Via Capelas to Caldeira Velha where you can take a swim in another natural warm pool, beware of the smell of sulphur though! We intended to go Whale Watching, but we had to book one day in advance. So we strolled our way through Ponta Delgada, it?s a small city with nice little streets, you shouldn?t be expecting to do a lot of shopping though. We parked our rental car in the parking deck below the promenade, it?s very large and modern. Futurismo was the company where we booked our Whale Watching trip. They have lots of experience and they give your money back when you don?t get to see any whales or dolphins. It didn?t turn out to be our lucky day, we saw some Sperm Whales from a great distance and no Dolphins at all. Even though it was pretty foggy this day, we followed the Serra Devassa trail (PRC5SMI) http://www.trails-azores.com/index.php?ilha=saomiguel&id=41. We enjoyed it, I think we would have had some nice views if it wasn?t for this mist. We might as well check to see if the Sete Cidades (Seven Cities) were fog free and they pretty much were! My husband noticed an abandoned hotel alongside the road. Being the urban explorers that we are, we couldn?t resist having a peak inside. The Hotel Monte Palace used to be a 5-star hotel for the rich and famous and closed in 1989, you can tell this by all of the old tv?s, computers and papers lying around. It may sound a bit strange, but this was one of the highlights of my holiday. It?s time to explore the northeastern part of the Island. First up, Miradouro de Santa Iria, one of the nicest views of the coast. The waterfall at Miradouro do Salto da Farinha had dried up, but luckily there was another one not far down the road. At Lomba da Fazenda we did the Trilho Pedestre trail (PRC31SMI) http://trails-azores.com/index.php?ilha=saomiguel&id=52, which is marked as easy, but it was far from it, the heat didn?t help much. Don?t take your car down to the Ponta do Arnel lighthouse, we decided not to and it turned out to be a wise decision. It has a 25% incline and isn?t wide enough for cars to pass each other. The first serious rain today. My husband took the opportunity to pick up his book and just do nothing for a change. In the afternoon we decided to take the car and see what the weather was like further down the island. The rain was soon behind us, drove somewhere where we wanted to do some hiking, but didn?t much feel like it, so we ended up at the hot springs in the centre of Furnas Village. Yay, the top of Lake Fogo isn?t covered in clouds today, just in time, the last walk on our list: Praia to Lagoa do Fogo (PRC2SMI) http://trails-azores.com/index.php?ilha=saomiguel&id=40. It?s a tough walk, hiking boots are a must, but the clear blue lake at the end is very rewarding. Time for lunch and back down again. Said our goodbyes to Ed and Bonita, handed in our rental car and took of back to Amsterdam. First, I apologize, I saw your post three weeks ago and thought I hit the "approve" button. Second, thank you for your thoughtful post.